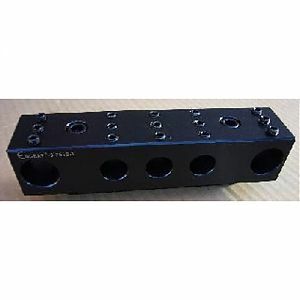 This 6 position Multi-Block tool holder is slightly wider than the single position with a compact area for two operations. Gives ability to ID bore and OD turn without reversing spindle. Use a split point drill first then bore 2nd without need of a center drill. Differential spacing of the holes in each holder allow different tool configurations for narrow and wide spaced tools on one block. An end stop mounted to the table provides repeatable location of the tool block for quick changeover of setups. MB-0039 Four - .625"dia. + Two - 1.0"dia. MB-0040 Four - .750"dia. + Two - 1.0"dia. 1.2"